One of the perks of my previous job was the wining and dining of clients, which sounds kind of frivolous, but really, it's not. Some folks don't like doing it, thinking it's a waste of time, but when it's with people you like and respect, and love working with, shared meals are pretty fun. It's a great chance to see your colleagues and clients outside the work environment, outside of the stuffy cubbies and even stuffier conference rooms. Always great for makin' memories. 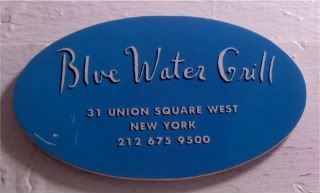 And, if you get to eat at some of the better restaurants in the city, like Blue Water Grill, hey, what's the harm? Especially when they have a really great dessert chef. If I truly had my druthers, I'd totally go into these nice restaurants and order just dessert. Of course, for me, it's like the first thing my clients learn about me at dinners - I never share desserts. What? Dinner's what you go through to get to dessert. Anyway, thanks to a Tweet from @Newyorkology, I found out that tomorrow is Free Dessert Day, which means that some restaurants are offering a somewhat dubious treat of one free dessert for every two entrees purchased. One? Really? It should be a one for one ratio, methinks. Still, if I were entertaining a client tomorrow, I'd offer up that opportunity for them. The meal at a participating restaurant, I mean. The dessert? Would be all mine, thankyouverymuch. I think she'd rather eat it than watch it being made. Otherwise she'd have found Cupcake Wars by now. While it's true I'd rather eat than ever watch, I have watched Cupcake Wars. I just get annoyed that they have to break down their displays for immediate transpo to whatever event they're catering. How is *that* giving the clients the best product possible.